Inspired by the innovative thinking that enabled people behind the iron curtain to create bootleg records from X-ray films (X-RAY AUDIO PROJECT), the ‘Smith’ vestment celebrates the very human need to create and communicate by any means necessary. The repetition of an abstracted mouth x-ray begins to mimic a film strip whilst also evoking the liquid light shows synonymous with psychedelic counter culture. 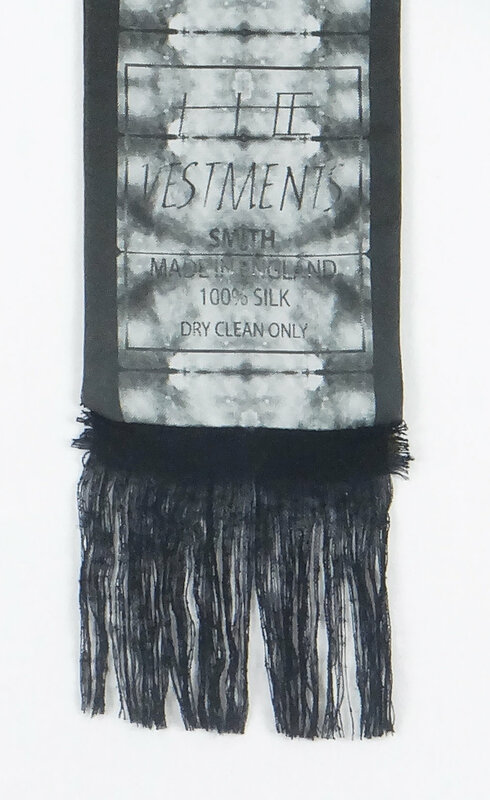 The face and back of the scarf are both printed silk twill, whilst a layer of raw silk runs the length inside peeping out either end forming the fringe. This third layer of silk gives the piece an added weight, not dissimilar to wearing a very thin sleeping bag around your neck. Each colourway comes in a numbered edition of 15.